It’s the third day in a row that began with temps in the negative double digits. That meant a day filled with deep cleaning, laundry whirring, and cooking something delicious. Make that delicious and boozy. I don’t drink, but this weather is making me consider it…hehe. A good homemade rum cake has continued to elude me, but what if we made it more complex? With warm apples on the inside and a crunchy cinnamon-sugar outer layer? It turned out to be one of the best calls I’ve ever made. Enjoy! Preheat oven to 325 degrees. Combine the sugar and cinnamon in a small bowl and set aside. Grease a bundt pan with butter, then spray it again with canola oil spray to get in every crack of the pan. Dust the inside with 1/3 of the cinnamon-sugar mixture. In a medium mixing bowl, sift the cornstarch, flour, baking soda, baking powder, and salt. Set aside. In another medium sized mixing bowl, preferably one with tall sides, beat the butter and sugar together until fluffy. Add the brown sugar and beat again, until the mixture is fluffy and has a uniform brown tint. Add the eggs, one by one, beating well after each one. Scrape the sides when needed. Add the vanilla and beat again. Next, add the flour, sour cream, and half and half in alternating turns, starting and finishing with the flour. Make sure the batter has a cake batter consistency (add more half and half if needed). Fold in the apples, then pour half of the batter into the bundt pan. Sprinkle some of the cinnamon-sugar on the top, then put another layer of batter one. Sprinkle the last of the cinnamon-sugar mixture on the top. Place in the oven and cook about one hour. When the cake is done, a knife can be inserted into the middle and come out clean. While the cake cooks, make the syrup. Combine all ingredients in a small saucepan and boil for 5 minutes. Let cool completely. 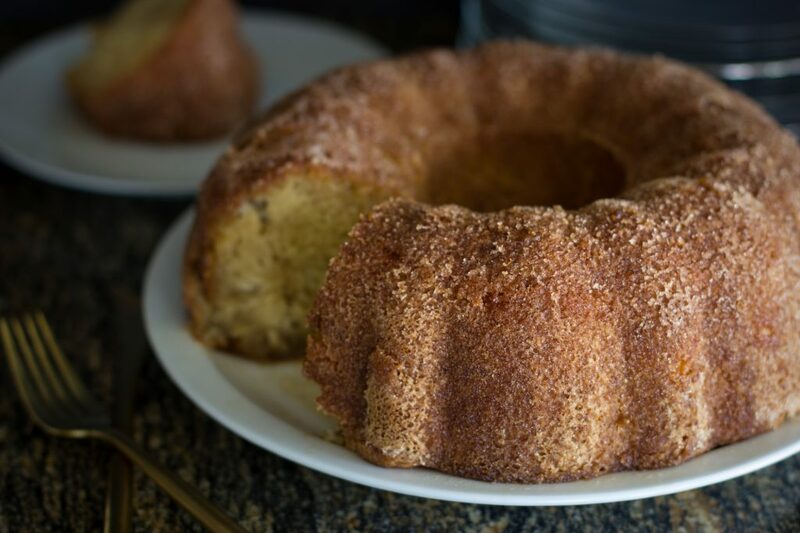 Let the cake sit ten minutes in the bundt pan, then dump it onto a plate or cake stand. Pour cooled syrup over the top.